Johnson & Griffiths is a full service art conservation, architectural restoration & decorative arts studio. Our experienced team of artists, artisans & conservators develops tailored solutions to unique decorative arts challenges of all shapes, ages & sizes.. Whether restoring an object, room or entire building interior, our guiding ethos is grounded in aesthetic sensitivity, respect for historical context and our passion for the decorative arts. We combine more than 35 years of technical experience and knowledge of the materials and methods used in the restoration arts to work in partnership with clients, architects and general contractors. J&G’s conservators have the philosophy that conservation is the perfect marriage of art and science. Into every conservation challenge, we bring with us the sensitivity of artists and the deliberation of scientists. We are bound by the code of ethics and guidelines of the American Institute for Conservation of Historic and Artistic Works (AIC) and are ever conscious of our role as caretakers of our cultural heritage. Some of our more notable conservation projects include: the Eugene Savage mural in the PA State Finance Building; ceiling and wall murals in the PA State Forum Building; Filippo Costaggini murals in St. Mary’s Church in Lancaster, PA; and Dean Cornwell murals for the Bethlehem Steel Corporate headquarters in Bethlehem, PA.
J&G takes a holistic and integrated approach to paint analysis. We’re different in this regard because each of our team members possesses a critical understanding of and working experience in all aspects of the decorative arts and paint analysis. 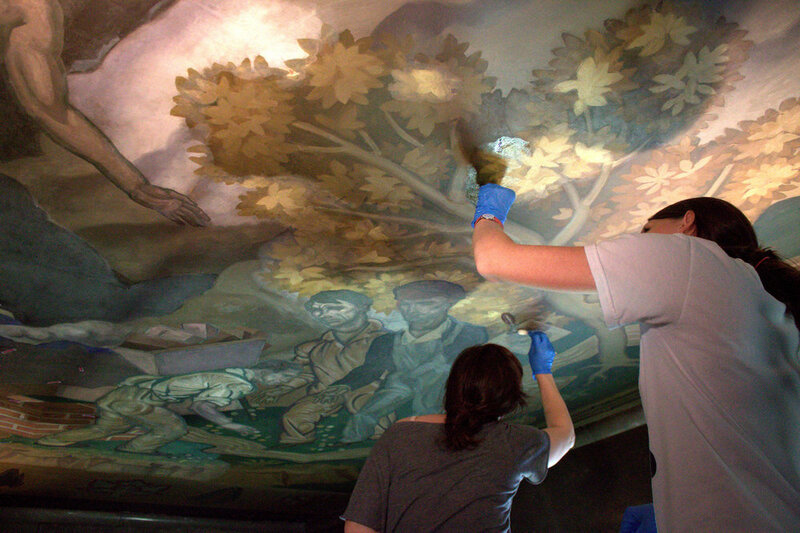 From retrieving and analyzing microscopic paint and finish samples to interpreting and replicating historic, decorative finishes, J&G’s team of analysts, conservators and decorative artists can accomplish it all in-house.